The first image should be pretty self-explanatory. All it is showing is a view of an idealized jet-streak (just like the one Frank posted on the last page at H2), divided into four parts. 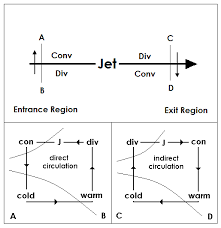 These are labeled such that you are flying along in the jet itself (hence, as you enter the jets western side, to your left is the left-entrance region and to your right is the right-entrance region). 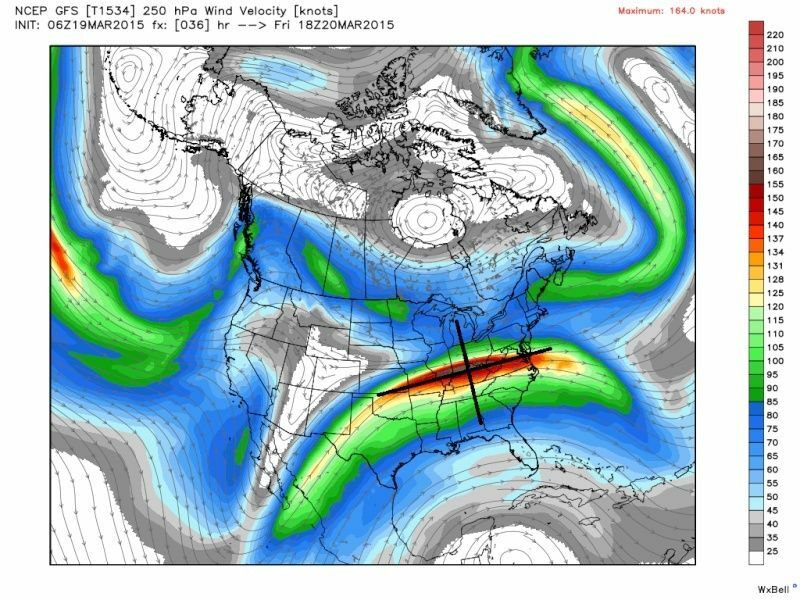 Now, as the wind (geostrophic/regular wind we think of when looking at this level) comes into the western side of the jet-streak, it experiences a relatively large net change in speed (acceleration.......that's why it is called a jet-STREAK) over a relatively short distance. However, the atmosphere does not like these changes because of the force balances that it is governed by, and so tries to maintain these balances by the only way it knows how: Vertical motion. How does it do this? Well, if the actual wind is being accelerated by the jet-streak which then takes it out of balance, then the only way that the atmosphere can slow it down and bring it back into balance is to slow it down. 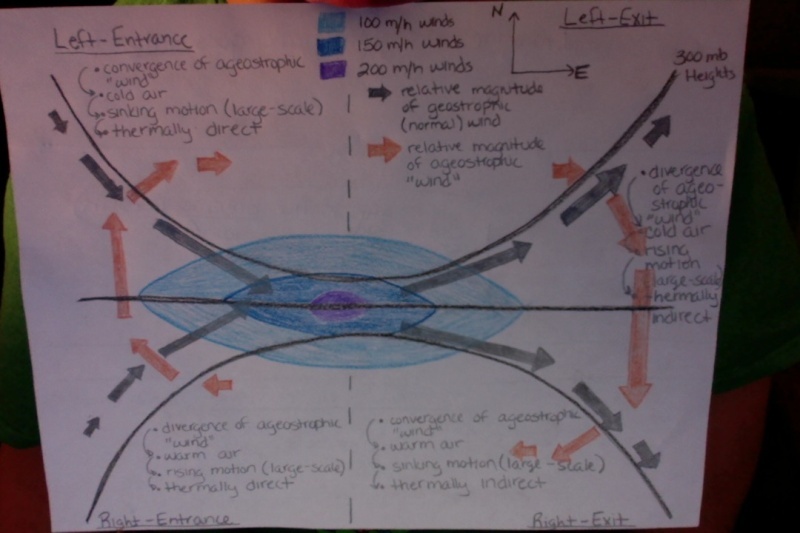 To do this, the atmosphere "generates" a secondary "wind" called the ageostrophic "wind" that opposes the acceleration of the regular wind by "blowing" in the opposite direction (think of walking into a head-wind....a lot harder than going with a tail-wind, right?). However, as this "wind" is "blowing" against the regular wind, as it does so, it is "moving" across generally large horizontal distances; large enough that it becomes influenced by the Coriolis force, which acts to deflect things to the right in the Northern Hemisphere. So now picture this "wind" moving against the regular wind but also being deflected to the right as it does so. Also picture that this wind decreases to nothing (ideally) as you move further away from the jet-streak in any direction. If you can do these two things, you will see that the ageostrophic "wind" converges in the left entrance region of the jet-streak (again, think of yourself flying into the western side of it). Because of this convergence, and assuming that the Tropopause (which is not too far above this level) is an impermeable layer....if the winds are converging here, then THEY MUST CONVERGE AND SINK. This causes large-scale subsidence in the left entrance region of a jet (in the Northern Hemisphere). If air is sinking, air also has to rise (conservation of mass). Remember how the ageostrophic "wind" "blows" against the normal wind and is then deflected to the right??? 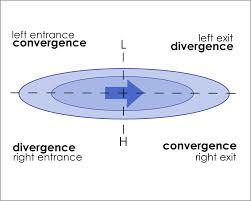 This leaves an area of divergence in the right entrance region....if air is spreading out here, then it must be getting replaced by air below it: large-scale ASCENT!!! Now, the last thing I want you to try and picture (refer to my second image) is taking a slice across the jet in these areas. If you can do this, you will find that the warm air (in the right entrance region) is rising and the cold air (in the left entrance region) is sinking. This is known as a thermally direct circulation. 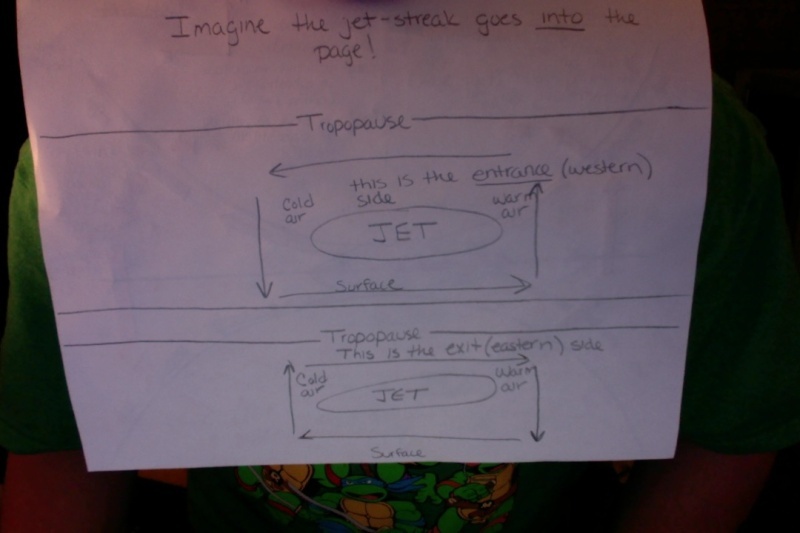 For the exit regions (eastern side of the jet-streak, left and right, again with respect to you flying in the jet), these processes are reversed. Instead of the regular wind speeding up, it is now slowing down as it exits the jet-STREAK, and again, the atmosphere does not like this because it is being thrown out of balance. So, again, here comes the ageostrophic "wind", which still opposes the net change in speed of the regular wind (which is deceleration here). However, this time, that means it is "blowing" WITH the normal wind (think of walking with a tail-wind now, and it is trying to "bring the regular wind back up to speed", so to speak). The Coriolis is still able to act on it, so it is again deflected to the right. Since the ageostrophic "wind" still decreases to nothing the further away from the jet-streak you look, you end up with a circulation such that the right-exit region sees the convergence and the left-exit region sees the divergence (again assuming the Troposphere is impermeable). Where there is convergence of this "wind", there is again large-scale sinking motion, and where there is divergence, there is large-scale ascent. Looking at another cross-section (again, refer image two), you will find that cold air in the left-exit region is now being forced to rise, while the warm air is being forced to sink. This is called a thermally indirect circulation. Basically, this causes two opposing cross-jet circulations on the western and eastern halves of the jet, respectively, which are what are referenced when "jet dynamics" are mentioned in discussions. Here Doc, and for anybody who read but did not understand: I tried conveying the information that I wrote out in these two graphics. Please let me know if they help. Also, there are added forcings that play into these circulations, but the ones that you see here are the ones that are MOST responsible for the circulations associated with upper-level jet-streaks. Again, the stronger the changes in speed over shorter distances, the stronger these circulations become. If you would like to see the other forcings that are involved, let me know and I will explain those as well.